fresher than the farmers market. we drop illness every monday @ MANIC. 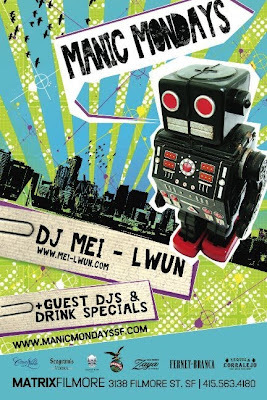 this week is certainly no exception with special guest dj remeddy alongside resident and host dj mei-lwun. drink specials on fernet and coralejos for your liberal libation. come early and stay late.. with the best in the bay on the decks you wont want to miss a minute. tables avail from $40 with a bottle of wine.